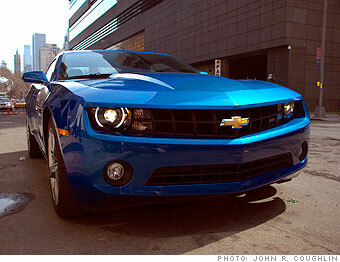 With the 2010 Camaro, GM reminds America that there's still a lot to like about Motown. When he handed me the keys to a brand new Camaro, the General Motors representative warned me this might happen. A few days later, I saw blue and red lights flashing in my rearview mirror. "I just wanted to look at the car," he said. There are those who will say the Camaro isn't the kind of car GM should to be making right now. It's an overpowered anachronism, they'll say, the kind of car nobody wants anymore. In fact, the Camaro is just what GM needs right now, and the need has never been greater. The American populace, surveys tell us, is ready to turn its back on GM as if this company had never done anything worthwhile for any of us. What a heartbreaker. Because, after decades wandering in the desert of rock hard plastic and marshmallow suspension, GM is finally bringing home the goods. Not everything GM makes is as good as this, but the Camaro hardly stands alone. It's certainly the most eye-catching example of what GM is doing right today. The design looks even better on the street than it did on the car show floor, the steering feels right, the power is there - in V6, as shown here, or V8 - and even the fuel economy is remarkable. Stick with us through the rest of the gallery to find out why the Camaro sends all the right messages for GM.